Otis Frampton is big on offering otherworldly and charming stories. 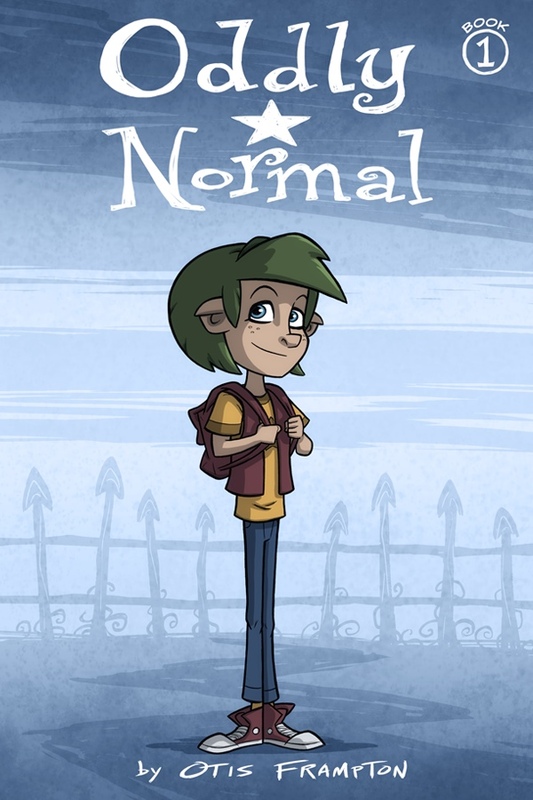 Oddly Normal is one such story and in it, Frampton tells the story of a girl who doesn’t feel like she fits in, no matter where she goes. The young heroine of the March graphic novel from Image Comics endures the bullying of other kids for her green hair and pointed ears. Oddly got those traits from her mother, who is a witch, but didn’t get the ability to use magic along with them. Or so she thought. A fateful wish on her 10th birthday leads to her parents disappearing, and Oddly must travel with her eccentric Auntie to Fignation, the weird world of supernatural beings, to find out how to get them back — if she can get them back. There, as the first “Earther” that her new classmates have ever seen, Oddly feels as much of an outsider as ever. How will Oddly navigate the perils of a magical middle school and find her parents? And will she ever find a place where she’s accepted? One thing is sure, though — Oddly is going to have to learn to stand up for who she is if she’s ever going to have any hope of being happy, wherever she ends up. Fans can find out in Oddly Normal, Book 1, which hits comic book stores March 11 (Diamond Comic order code JAN150646) and bookstores March 24 (ISBN 978-1-63215-226-8). The charming and otherworldly ODDLY NORMAL by Otis Frampton tells the story of a girl who doesn’t feel like she fits in, no matter where she goes. The young heroine of the March graphic novel from Image Comics endures the bullying of other kids for her green hair and pointed ears. Oddly got those traits from her mother, who is a witch, but didn’t get the ability to use magic along with them. Or so she thought. A fateful wish on her 10th birthday leads to her parents disappearing, and Oddly must travel with her eccentric Auntie to Fignation, the weird world of supernatural beings, to find out how to get them back — if she can get them back. There, as the first “Earther” that her new classmates have ever seen, Oddly feels as much of an outsider as ever. How will Oddly navigate the perils of a magical middle school and find her parents? And will she ever find a place where she’s accepted? One thing is sure, though — Oddly is going to have to learn to stand up for who she is if she’s ever going to have any hope of being happy, wherever she ends up. Perfect for young fans of Wicked and A Wrinkle in Time, ODDLY NORMAL, BOOK 1 will be in comic book stores on March 11 and in bookstores on March 24. It is specially priced at $9.99 and available for pre-order now.